One of them is Green Camping! For all Green Campers who arrive by themselves or in groups of up to nine people, nothing changes compared to last year and Green Camping stays free of charge. There is no possibility to save space for friends arriving later. Fill in the reservation form HERE. For all Green Campers who arrive in groups of ten people or more wishing to camp together, in 2018 we offer the possibility for the first time to rent reserved space in the GREEN CAMPING area. Unfortunately we are unable to offer this service free of charge, due to the logistical implications (plotting, etc.). The surface available is 10m² per person. Therefore, the space reserved for 10 people will be 100m². – Only tents and gazebos with no added elements are allowed. – Big furniture elements such as armchairs, sofas, beds and refrigerators are not allowed. – GREEN CAMP users agree to take their whole tents and camping equipment with them on the day of their departure and to dispose of their whole waste separately (recycling-ready) at the GREEN CAMPING waste disposal station. As you can see in the map, we have also decided to relocate the Green Camping area, in order to satisfy the growing demand and avoid a saturation like last year, for which we do apologize once more. But no need to worry: The footpath from the exit of the Green Camping area to the concert area is roughly the same length as it was before. In the GREEN CAMPING are we depend on your active support. For the duration of the festival, there will be a contact person you can talk to regarding any questions, problems and (sensible) suggestions. Since the surface for GREEN CAMPING is limited, camping there will only be possible with a prior reservation. Single persons and groups up to nine people: CLICK HERE! Groups over nine people: CLICK HERE! We are taking reservations starting now and until 30.06.2018. Should the available surface be used up before that date, the reservation process will end automatically. After completing the reservation process, every person making a reservation will receive an email with precise instructions on how to proceed at the festival entrance, so please make sure you enter your correct email address. ATTENTION: Please make your reservation only once you know exactly how many people will be in your group. The registered number of people is final and may not be changed afterwards. Each group reservation must be made by ONE MEMBER of the group only. There is no need to register each person individually. 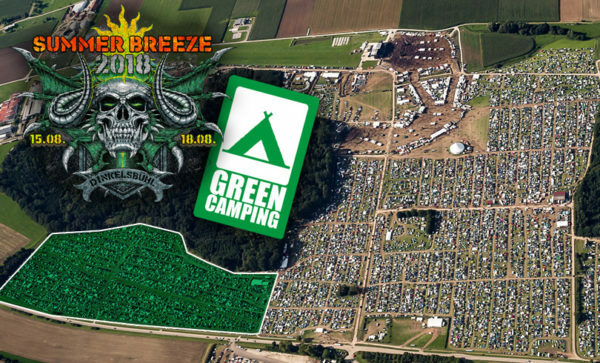 Only registered people will have access to GREEN CAMP. Access is not granted without a valid pass, meaning it is not possible to invite people from the “regular” campsite into the GREEN CAMP area. Naturally, the rules that apply on the regular campsite do also apply on the GREEN CAMP area, in addition to the special rules. You can get an overview in our Festival ABC. GREEN CAMPING relies and depends on the responsibility of the people who make use of it. We hope for some intra-group control. If anyone acts flagrantly against the GREEN CAMPING philosophy they lose the right of access and have to camp on the regular campsite. In case of gross misconduct, we reserve the right to expel the person in question from the festival altogether! There will be an appropriate number of portable toilets and urinals in the GREEN CAMPING area for use free of charge. There will be paid showers right next to the GREEN CAMPING area.